And here's the first 1/6th of the pattern completed! Still a long way to go, but you can really see how it's coming along now that I've completed one whole sheet of the pattern (now measures 11x17cm). The depth of shading is really fantastic...I really need to get that new daylight bulb, these pictures aren't doing it justice at all. 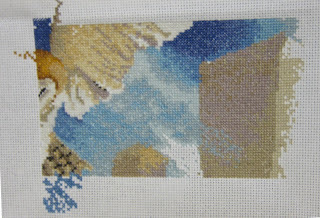 I've made a start on the next sheet down (where you can see the new blue patch starting), mostly to get a fairly dull bit out of the way - there's nothing but fence and sky and an owl claw here! Also because I'm too lazy to be taking the fabric out of the frame often - it's on rollers so I just moved it around and slack it off after each session. No crafting tonight as I have a date with my beloved! 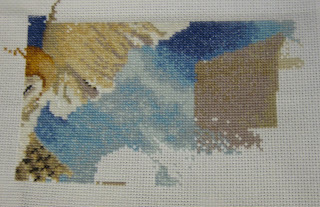 But over the weekend I hope to finish at least one more commission, I'm really starting to see the end in sight now. At some point I'm going to get the machine out again and have a good fiddle - many thanks to Gail, who suggested that the plastic foot is possibly for embroidery, and to Kirstine for loads of helpful ideas. I may be picking both your brains again in future! I did actually get a bit of sewing done yesterday; K was given a "make your own" doll for Christmas, but the materials supplied (er, mostly sticky tape) meant it was an ornament rather than a doll you could play with. So we decided we'd get making our own and so far the doll has a shiny turquoise satin tube dress and a freaky fun-fur crocheted dress-thingie. K likes them, anyway! We've been drawing outfits in a sketchbook which has been loads of fun to do together. Pics next week, probably. Hi there, my name is Anne, I downloaded your Sunshine in the window granny square pattern, and am in love with it! haha! Thank you so much for posting it! I did have some trouble with my corners (blue sky) Not sure if I was reading the downloadable pattern wrong, but it didn't show how to make the corners? Anyway, I figured it out and it looks wonderful, so thanks so much for the inspiration!